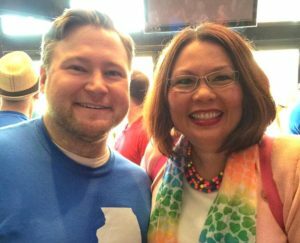 Michael Ziri, a veteran in legislative affairs and a former Springfield elected official, is the Director of Public Policy at Equality Illinois. Mike spearheads an aggressive legislative agenda in Springfield, builds and strengthens relationships with officials and political leaders throughout the state and in Washington, D.C., and develops policy initiatives. He also staffs the election-related activities of the Equality Illinois Political Action Committee. Joining Equality Illinois in January 2015, Mike brought to the organization seven years of experience working for Illinois state government, capped by a position as the Director of Legislative Affairs for the Illinois Environmental Protection Agency. His previous positions included legislative liaison for the Illinois Department of Natural Resources, legislative analyst in Gov. Pat Quinn’s office, and legal assistant for the EPA. He also served two terms as Trustee of the Springfield Metropolitan Exposition and Auditorium Authority, making Mike the first openly gay elected official in Sangamon County. A native of Springfield, Mike earned his bachelor’s degree at Illinois College in Jacksonville and his master’s degree at the University of Illinois Springfield. He lives in the Uptown neighborhood of Chicago.